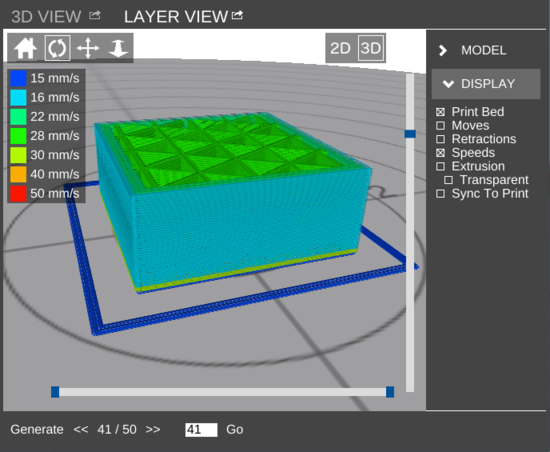 LAYER VIEW in 3D mode. Colors indicate speeds. LAYER VIEW is a pane which allows the user to preview a print's G-Code tool path as a visual representation. It has two modes: 2D and 3D. Note: 3D mode is not available on the MatterControl Touch. It is accessed by clicking the icon in the pane on the right side of the Main Screen. The pane can be popped out into its own window. View Controls is a set of tools which allow the user to manipulate the view and/or models currently displayed. Enters LAYER VIEW's 2D mode. Enters LAYER VIEW's 3D mode. Slices the current model using the slice settings and displays the tool path. Once G-Code for a model has been generated or loaded, the main area of the LAYER VIEW pane will display the tool path. Depending on which graphical display mode is selected, the toolpath is able to be displayed in different ways. Navigation for a 50-layer print. Layer 37 is currently displayed. Navigate to the layer specified in the field to the left of the Go button. 2D mode displays one layer at a time in a two-dimensional graphic. 3D mode displays the tool path in a three-dimensional environment. The specified layer and any lower layers are shown. The sidebar in LAYER VIEW has two sections: MODEL and DISPLAY. Contains information about the print. The length of time the print is estimated to take. The length of filament the print is estimated to use, in millimeters. The volume of filament the finished print is estimated to be, in cubic centimeters. The estimated mass of the finished print, in grams. This is calculated as the filament density in grams per cubic centimeter times length of filament, in centimeters, extruded. The estimated cost of the print, based on the amount of material used, the density, and the price of the material. This information will not be visible if the material cost is set to 0. Toggles the graphical display of the print bed. Toggles the display of non-print moves in the tool path. Toggles the display of locations of the start and end of retraction events. Toggles the display of color-coding of the tool path to indicate the speed at which it is run. The tool path changes to a different color for each speed specified under the Speed sub-category in General settings. A legend is generated at the top left of the pane. Toggles transparency of the tool path. Only available in 2D mode. Draws the tool path in real time while a print is active. This page was last modified on 1 November 2017, at 10:30.